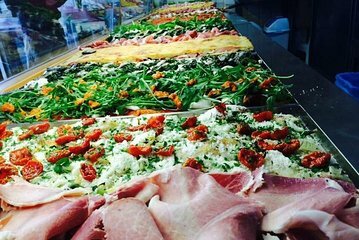 Tour de 4 horas de caminata y comida en Roma con un guía. Muestra hasta 18 diferentes delicias clásicas romanas comestibles. Comience con un típico desayuno romano. Siéntate en una trattoria romana para un poco de pasta y vino. Termina el tour con un delicioso gelato. Our family did the morning tour with Jess, she was so passionate and knowledgeable about food. We sampled so much food, tutto bene!! Devo was an awesome guide. She was very personable and accommodating to every person in the group. Enjoyed all the food thoroughly. The pasta and pizza were out of this world!! Devo was funny and provided an amazing food tour. Highly recommended especially when your trip is on limited time. Contrary to what some have said- there is an abundance of food provided. We took this tour the first day in Rome! We loved it and learned so much! We went back to several of the stops during our stay in Rome! Raluca was awesome, very friendly and informative! This was definitely one of the highlights on our trip! We highly recommend this tour and recommend to take it in the beginning of your trip, to help you understand some of the little things. Like what wine to look for, the difference between buffalo mozzarella and cow mozzarella, the tastes of aged balsamic, how to order at a bar (coffee shop) and what to look for in authentic foods of Italy! Thanks Raluca for a great tour! This tour was recommended to us by a friend and we are so glad we went on it. Morgan did a wonderful job explaining the food culture and the area we explored. Highly recommend this tour. Raluca was an excellent, informative and full of energy tour specialist. Her good nature and fun personality made this my favorite Rome tour above the Vatican and the Colosseum. Not only did we taste authentic Italian foods and wine along the way but the explanation was very interesting. Thanks Raluca making this such an exciting adventure. We began our three week trip to Italy eagerly anticipating the food. Fortunately we began our first full day of the trip with this tour, in Rome. Our guide was Jessenia Rojas (Jess). And she was simply outstanding! We learned how to order pizza by the slice, how and what to order at a “Bar” for breakfast, how to choose good canoli and gelato, and how to avoid the not so good. We enjoyed “fluffy” gnocchi, delicious eggplant parmigiana, ravioli, wine, cheese, prosciutto, aged balsamic vinegar, and much more. 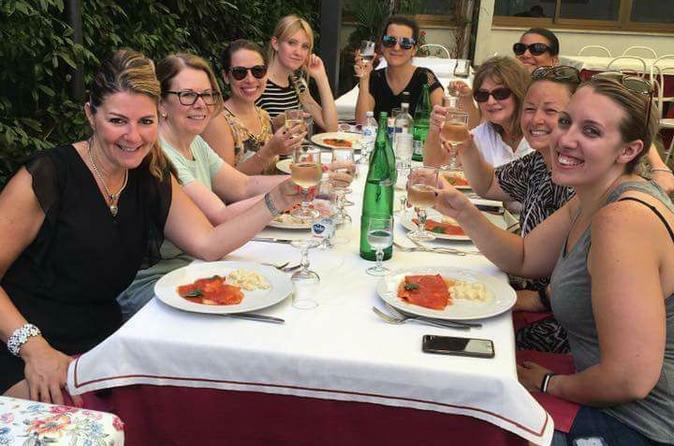 This tour was fun and helped us have wonderful dining experiences throughout our trip. We were also provided with some restaurant recommendations in Rome. We went to IL Ciociaro for fabulous seafood pasta. Wonderful experience with Morgan. A great way to start a Rome vacation so you know where to eat and what to ecpect. Alina was terrific, very friendly and kind. This particular food tour had quite a bit of people, but all the food was delicious and everyone was able to get a good amount of food. My wife and I thoroughly enjoyed it! Thanks for the wonderful experience!